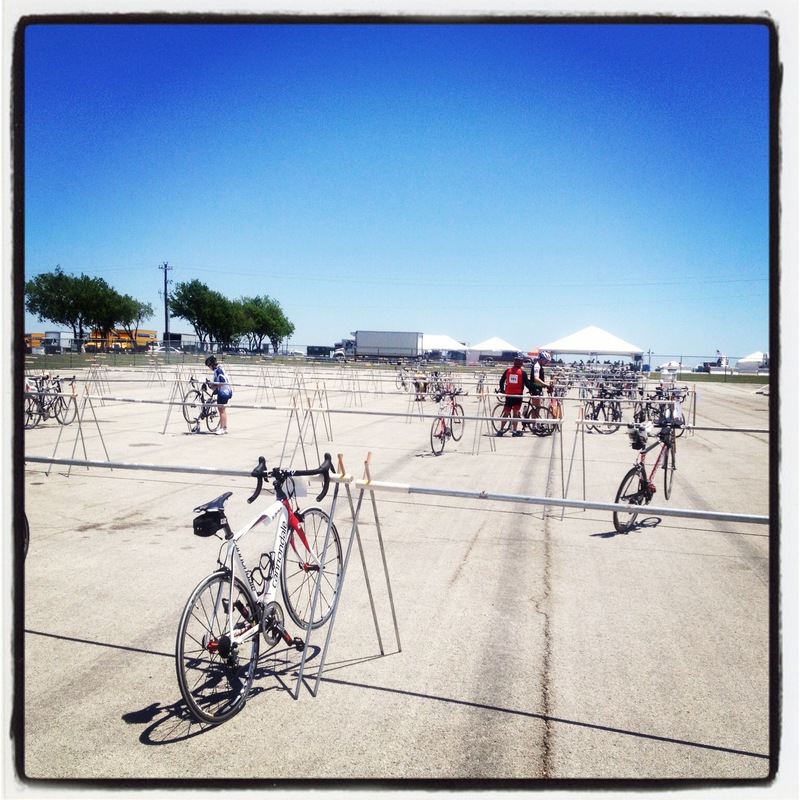 Thanks to everyone who read about why I was going all the way to Dallas to ride a bike for 150 miles. In short, my cousin has MS and started the Feisty Devils cycling team along with her husband to fight MS. All the other major teams in the ride are associated with bike stores or corporations. Our group is friends and family and raised the second highest amount overall. They’re regularly in that spot and to date have raised nearly $2,000,000. That’s friends and family. In other words, it’s a lot of good people supporting each other and it’s a terrifically powerful thing to be a part of. Thanks to all that helped me raise money and train for the event! Although I took and posted plenty of pictures, this is my favorite picture from the weekend. It’s at the finish of the second day of the ride. We’d just finished riding 65 miles after doing 81 the day before. The opening 30 of Sunday’s ride involved a good bit of climbing and pedaling into the wind. That’s a pretty rough start to the day. About 45 miles in, we had another stretch where we got more of the same and the miles were taking their toll on us. However, the final dozen miles the group I was riding with got out of the wind and we hit our stride. We were able to laugh and joke then ended the weekend together. At the center below is my cousin and we’re flanking her to cross the finish line with smiles on our faces. With Alyce, Michelle, Leticia, Karen, Jenifer, and Andy. A quick word on the first day which was more about throwing down miles. Saturday’s ride is the longer of the two and the one more people challenge themselves on. Each year I’ve done this has something a little different thrown in. Last year, there was a heat index of 97 Fahrenheit at the end of the race with a brutal headwind. This year, the temperature at Frisco, TX was in the 40’s when we got started which is really cold on a road bike. The wind wasn’t as much a factor this time until it helped us out a little at the end. A handful of us spent much of the ride at around the same pace. The whole day, it felt like I had plenty of strength in my legs and could push whenever I wanted to. I seem to always average in the 16mph range for rides in Atlanta where we have more hills. This day, we did 17.1 on a ride that was more than twice as long as anything I’ve done so far this year. Training to accomplish a goal like this makes it so much more enjoyable and successful. Thanks to my ATL friends who pushed me when I was getting ready! This is the view I got when I went to park my bike at the end of the first day. This whole area was filled by the end of the day. An even bigger smile was on my face when I saw how quickly we finished. Great job, Eric! I’m going to have to join you on this one of these years. I’ve always wanted to be a feisty devil! You definitely should. It may also be worth building an Atlanta chapter. I think there’d be enough people easily to get one going. 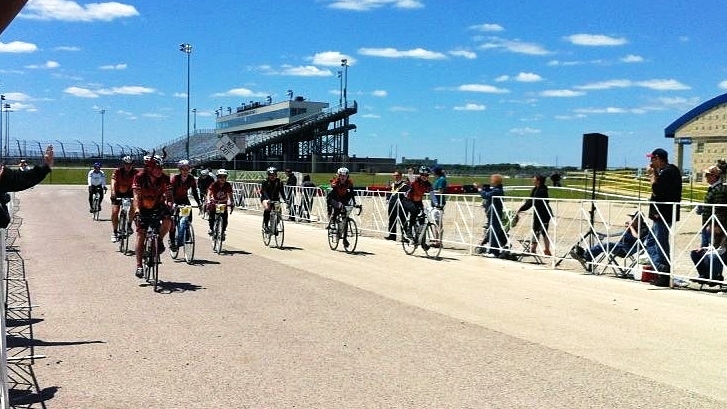 Congratulations on completing the MS150!